About 100%: Screw Meaningful. I Want Pretty. Screw Meaningful. I Want Pretty. I do not love all the ornaments on our Christmas tree. Interesting can mean a flurry of things, but most likely one of two: 1. The tree is so beautiful that you insure it from theft by Martha Stewart herself, or 2) The tree is so ugly that at the slightest glance it draws in your gaze and burns your retinas, accomplishing two divergent ends: blinding you and saving you from further harm. Our tree falls somewhere in the lower-middle end of the beauty spectrum. The hodge-podge of ornaments on the thing and the dark-light effect it displays due to new portions of the lights dimming each year (it’s a pre-lit artificial tree, kids) guarantee that our tree will not be featured on anyone’s Most Beautiful Christmas Tree list, ever. I blame my husband, who is in charge of our tree each year, and in addition to his inability to change with the times and unwillingness to adapt traditions, also has no eye for design or what looks nice at all in the history of the world. I know my judgments are harsh. Let me give you a life lesson: the truth is harsh, and in our house this means that our Christmas tree is ugly. But he does try, and he doesn’t complain, which is more than anyone can say about me on this matter. I love him for both of these things. Let’s move on. We were November newlyweds, which meant that from Christmas Tree One we had a fully decorated tree. We received many ornament gifts; no less than 89 were bride/groom ornaments, and of those, 99% of them were Barbie and (one) Ken. Let’s talk more about Barbie. Because I loved Barbies and played with them until I was too old to play with Barbies (I was 14), I received a Barbie ornament each year. My mother gifted them to me when I moved out because she is thoughtful and - I realize now - highly intelligent. We display 157 of them, each one cheaper and uglier than the last. Because my daughter loves Barbies and is on the fast track to also being awkwardly too old to play with them, I inexplicably buy her a Barbie ornament every year. Up on the tree it goes. Our tree is a veritable whorehouse of Barbies, tempting the one (always newly married) Ken each year with their unnaturally open-eyed stares and plastic ball gowns. Fair distribution of unsightliness across family members means that our son has his own collection of less-than-appealing ornaments. Let’s discuss the ugly factor of Darth Vader, Chewbacca, Yoda, and various spacecraft, which includes but is not limited to: TIE Fighter, TIE Interceptor, Land Speeder, and Star Destroyer. Star Wars bears no resemblance to Christmas in the slightest, yet we have them all. Yesterday I saw a new Jabba the Hutt ornament at the mall. I put my foot down at putting that snot monster on my tree. I’m probably the biggest Spongebob Squarepants fan out here, but I do not want him on my Christmas Tree. Spongebob is ugly times a billion. Same goes for Blues Clues, Jimmy Neutron, Barney, My Little Pony, Elmo, and whatever licensed character my children loved for a year and we bought as an ornament that they care for not at all today. *Editor’s note: This is the first year that I was able to convince my husband to leave some of them off the tree. Little victories. We have Disney-themed ornaments: The Nightmare Before Christmas, The Lion King, Disney Princesses (joining Barbie in her ever-growing harem), Winnie-the-Pooh. We have Scarlett O’Hara and Humphrey Bogart. Metal tractors and cars. 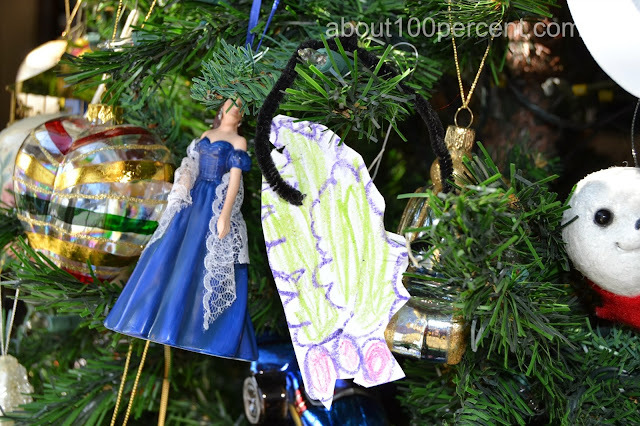 A whole slew of Victorian-themed ornaments that would be pretty on a Victorian-themed tree, notsomuch on ours. We have a football. We have a bear playing football. We have two hundred Penn.State.Santas. And we have every single ornament that our children have ever made from preschool to now, glued and crayoned and faded and wrinkled. If the hanger comes detached, we just stick it in among the branches. Because they are ugly, we hang them on the back side of the tree, which becomes the front side to everyone who sees it through the window. There’s so much potential for a beautiful tree every year. Every year, when I take it down, I combine themed ornaments in the hopes that next year when I say “leave that box in the basement,” I will not have to look at them. And every year, I find them all hanging up on the tree, my wishes falling on deaf ears. After all, these ornaments are meaningful. Each one tells a story, Andrea. Stop being such a Scrooge. Sigh. I’d like to think that Scrooge at least knew what looked nice. Note the dark spots. Try not to see them now. It's so nice when your neighbors can see the beautiful things in your home. 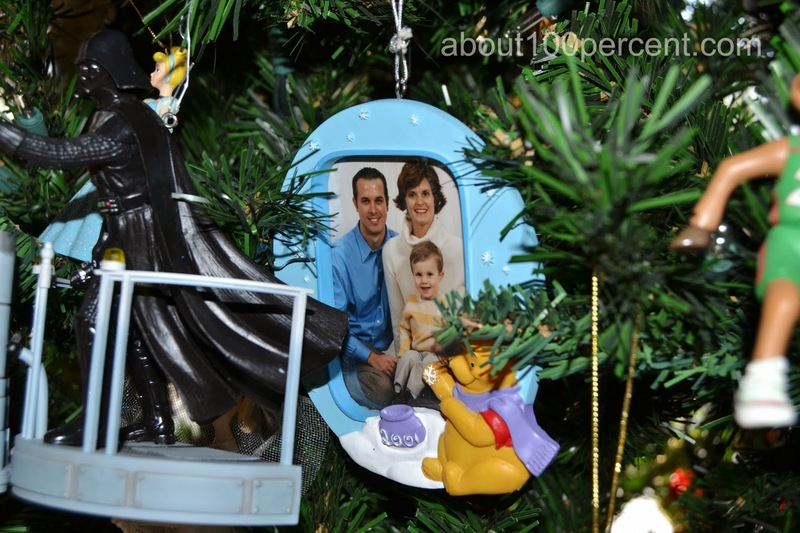 A wide shot of three cherished objects: Darth Vader, a Winnie the Pooh frame of us in younger years featuring my worst haircut, and the right half of a plastic reindeer playing basketball. Classic. Scarlett O'Hara holding court with something scribbled. Maybe holly. The white face is an arctic seal! Adorable. Who else besides us knows that Sleeping Beauty is also a tanning bed addict? Never saw one Humphrey Bogart movie. I don't know about you, but the Boogieman and a skeleton dressed up as Santa SCREAMS Christmas. 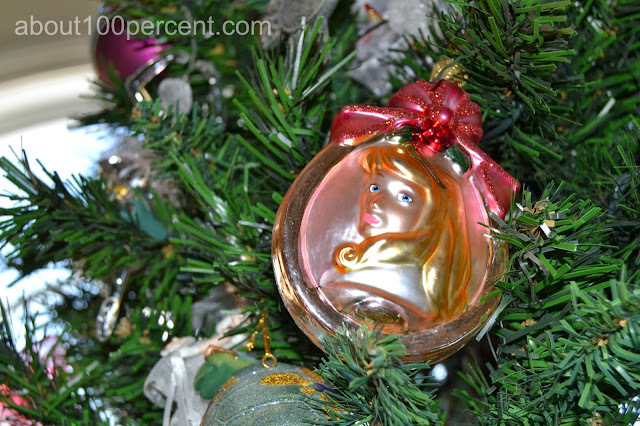 Prompt #3: A favorite Christmas ornament. Okay. Ahem. I am a Christmas tree snob. Sorry. I just have to put that out there. I will give you this - your tree looks beautiful from a distance, if I imagine it all lit. I do the same thing! Kids' tree and grown-up tree for sure! Weird thing is that kids' tree is the first thing you see when you walk in our new house. Oh well. It was a good run. Barbie Whorehouse? Hilarious! 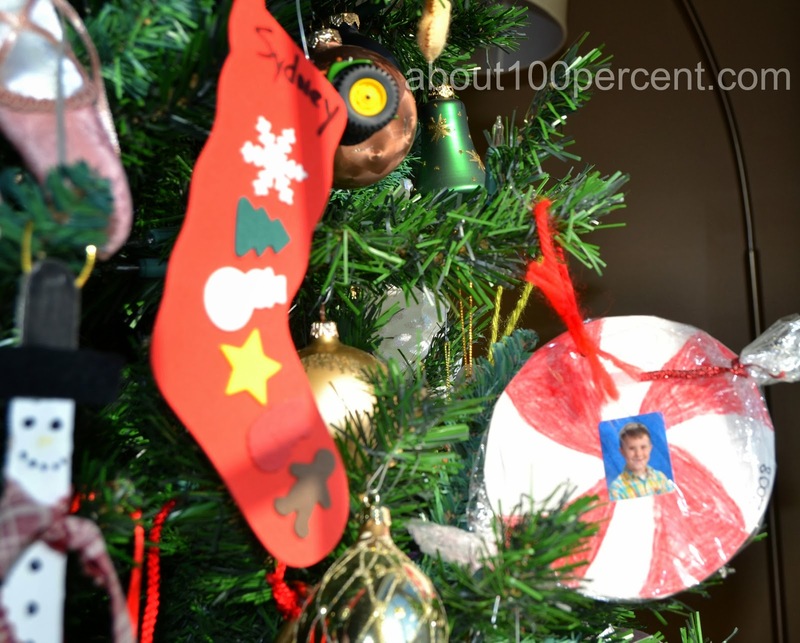 The worst thing about this is that we DO have a second tree that houses the kids' small ornaments. I did get him not to put that one up this year because it's even uglier than this one. WIN! On another note, I am overjoyed to hear that others agree with me on this. My husband and children have decided that I am over-reacting and also the grinchiest. Who deserves a nice-looking Christmas tree, thank you very much. I can't remember the last time I laughed so hard. Must show this to Matthieu. Just love you so much. You bring enough light into my life to illuminate those dark strips on your tree. I am so happy to bring light into your life, Jennie. I just wish it actually WOULD light up those dark patches. Does Matthieu enjoy a lovely tree? If so, can he teach my husband? OMG, your judgements are not harsh, but hilarious! 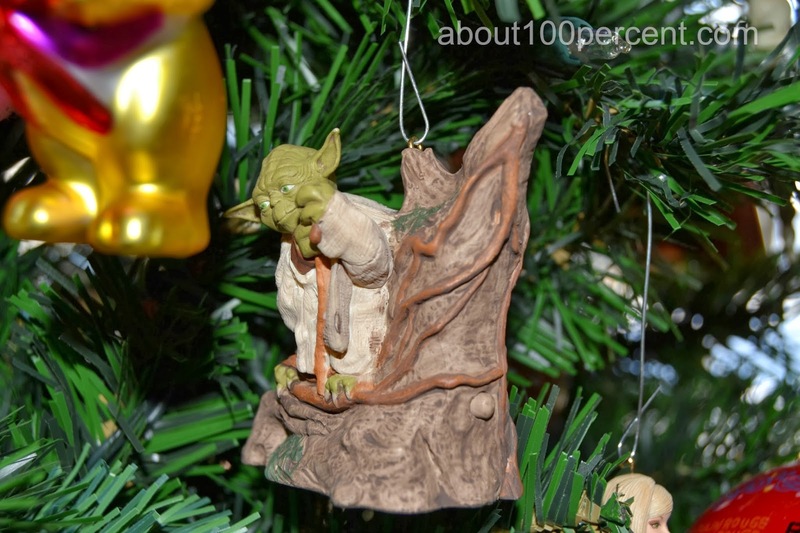 And yes, the tree looks beautiful from a distance, but I also LOVE the Yoda ornament. We call them balls, too. I quite enjoy them, and we have some nice ones. Of course, Yoda and Barbie cover them all up. Andrea, I am peeing with laughter. Thank you so, so much. Girl, you need to move that baby into one of the kids' rooms or out on the back porch (no offense) and hit up Target or some place like that for a new tree and a few of those packages of bulk ornaments and new lights for your OWN tree. Can I come do it for you? I love tree decorating!! Oh, Elaine! THANK YOU FOR OFFERING!!! Most of all, thank you for agreeing with me that this tree needs help. Back porch it is!!! Ha. The Humphrey Bogart one made me laugh. I am so sorry. It's probably the most random ornament we have. Wha? Humphrey Bogart? Seriously, WHY DO WE HAVE THIS???? Awww..... That's part of why I have up two trees (one in the living room and a tiny one in my daughter's room). The living room looks pretty and her room gets the rest of the "random" ornaments. I like to have a tree that looks nice, lol. Unfortunately for me, I only need a tiny tree to display all of the pretty ornaments we have. 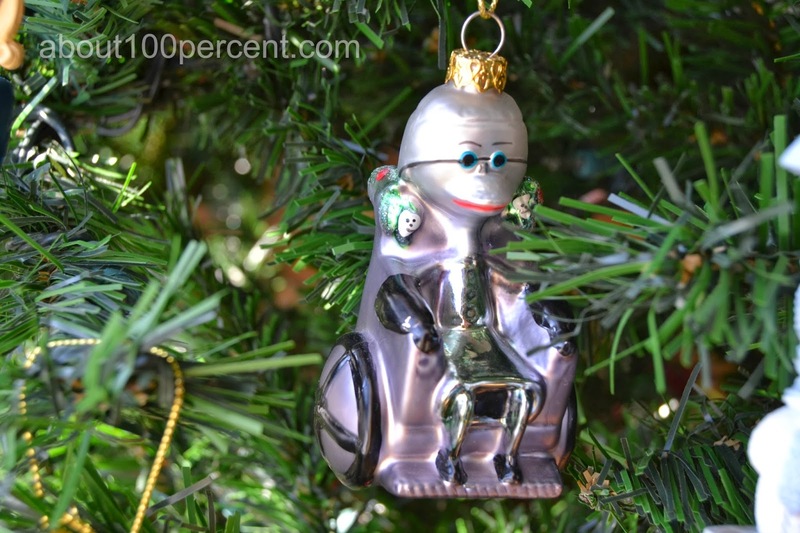 I have issues with ornaments, too. I wanted to have only Santa ornaments. We started with 2 trees years ago - one with only Santas and one with the hodge podge - gifts, the yearly ornaments for the boys, travel collections.....Now I have a tree in every room and they all have a theme except our downstairs family room - still a hodge podge!!! We are leaning toward having a tree in every room if my family keeps insisting on putting all of the ornaments on the tree. They are multiplying!! I love it - both the tree and your description of all those ornaments. I'm still laughing. Wouldn't it be horrible if a box of the ornaments, the ones you like the least, were mislabeled (something like "College notes") and didn't make it onto the tree next year? OK, I think I am definitely in the minority here - I love your tree just the way it is. Our tree is much like that. So is my Mom's. So was my Grandparents' before her. I love seeing the old ornaments and the handmade grade school stuff - such history and memories there. And a few good laughs, of course! 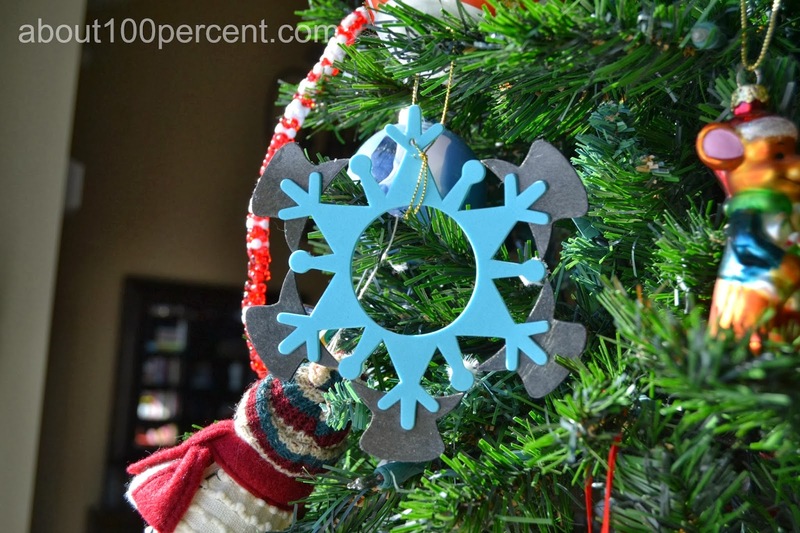 Maybe I love it because each year we add new ornaments that have some significance to our life that year - a bike the year you learn to ride your bike or a little guy ringing a hand bell the year you were in the church bell choir, etc. So I won't be winning any Martha Stewart prizes for sure, but I do love the eclectic mix! I like eclectic, too... but does all the eclectic have to happen at once on my Christmas Tree? Um... is that a dog in a pool floatie, with a cocktail? Your tree wins. Everybody else go home. Yes, yes it is. 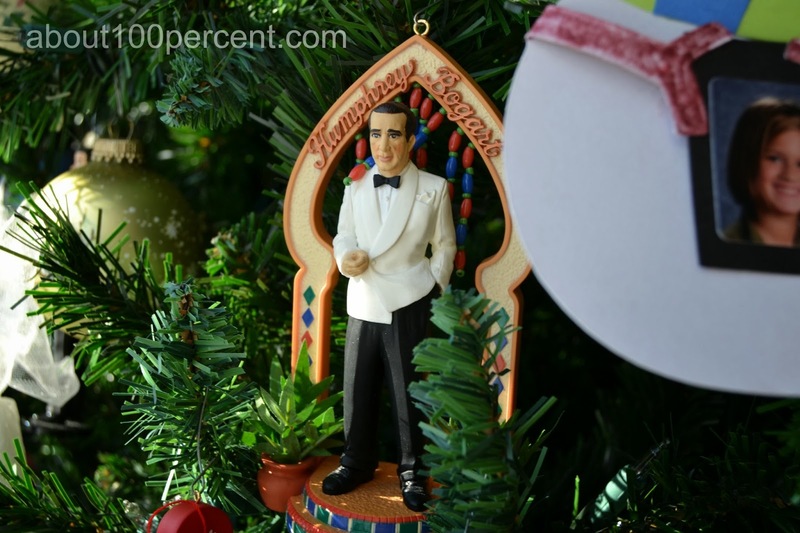 And hey - if everyone's going home, I ask them to take an ornament with them. I can see that some time in January, an entire box of ornaments will er, disappear. An accident. Ahem. Okay wait. ALL of that stuff is on your tree right now? All at once? I'm not going to show you a picture of my tree. All at once, friend. ALL AT ONCE. It's all so weird and horrible and kitschy and I love it! 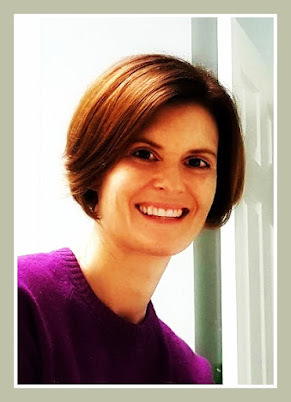 Thanks, Leigh Ann! EVERYBODY loves it! And it's all mine, heh heh, lucky lucky me. I actually really like your tower of small toys...did you say there was a tree somewhere? I'm not seeing it. All joking aside, while I think the fancy adult looking trees are pretty, they don't MEAN anything. I love the kids ornaments on our tree. They make it...unique! Unique is good! Thanks, Kat! Yes, I agree with the non-meaningful trees. There has to be a balance somewhere. We just haven't found it here yet. I love your tree for it's meaningfulness and that it represents all of you. That being said, I am considering an upstairs/downstairs tree situation at our house. I am torn between personal ornaments and the pretty. Let me know how it works out for you. I'm not sure that I will ever win this battle. Best tree ever! I'm jealous over here! I love your interesting tree! We have one that's extra interesting, as well - decorated by the kids, mainly with ornaments of their own making. It's a mess, but it's happy. I have a slightly nicer, tree, too, but it's still a hodgepodge, and is also sporting some dark spots this year (I HATE pre-lit trees, but hate stringing my own lights, too - you cannot make me happy when it comes to lights, apparently). Oh my goodness, this made me laugh and laugh this morning!! Awesome. Just...awesome. Thanks Jessi! I laugh about it, too - and then I cry. Existential Crisis, Party of One?